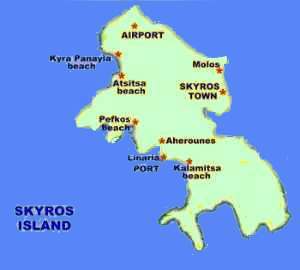 SKYROS is the southernmost island of the Aegean group of the Sporadic islands. Relatively untouched by tourism, it has managed to remain even to date a well kept secret. The islands main town and capital is also called Skyros or Chora is the biggest settlement and the second largest is the Linaria village which is the main port of Skyros island and lies to the west of the island. SKYROS - THE ALTERNATIVE GREEK HOLIDAY DESTINATION - The island of Skyros being a main Holistic holiday destination, attracts many travellers, including a lot of singles people, who visit Skyros in order to take part in one of the special holiday weeks on offer here, Yoga Holidays, Life Coaching Holidays, Creative Writing Holidays and many other alternative type of vacations offered.